Should HR go for after-work drinks? You want to unwind as much as anybody else but your employees may feel like you’re watching them, warns one industry VP. You want to unwind as much as anyone else and you’re keen to bond with your co-workers but your presence at after-work drinks could put others on edge – so should HR stay away? H​RM asked an expert. “If I went to something like after-work drinks it would only be for one drink,” says Halogen Software’s VP of HR Dominique Jones. “I wouldn’t go for the full night because I believe that people don’t necessarily relax if I’m there,” she continued. While Jones says it’s always nice to be invited, she’ll quite often remove herself from after-work drinks after a couple of hours – even if she’s out with her own team. Jones also says that while HR professionals have worked hard to shrug off their reputation as the “fun-police,” it hasn’t quite disappeared entirely. “I don’t want it to feel like I’m there to judge them or that I’m there watching,” she said. She also warned that employees will likely be more wary of HR professionals over any other executive. “By the nature of HR’s role and what people think about HR – whether that’s right or wrong – they probably think that I’m there watching more than if it was the CFO or the head of marketing,” she suggested. “There’s a little bit more of that ‘Oh my god HR’s here’ and sometimes they say it in jest but sometimes you know they really mean it,” she added. 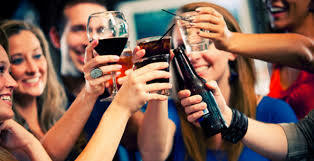 Jones also stressed that if HR professionals do go to after-work drinks, they should be extra vigilant with themselves. “We do have to watch what comes out of our mouth and there’s a time and place for that,” she said. “I recognize that what comes out of my mouth, whether it’s actually in this building or not, people still hear it the same way and will still contextualize it in the same way,” she added. One HR manager who preferred to remain anonymous agreed and said employees also suggested that leaders may entre murky waters when discussing office issues at after-work events.